An Honest Look at GTBets - Is GTBets a Safe Site to Join in 2019? 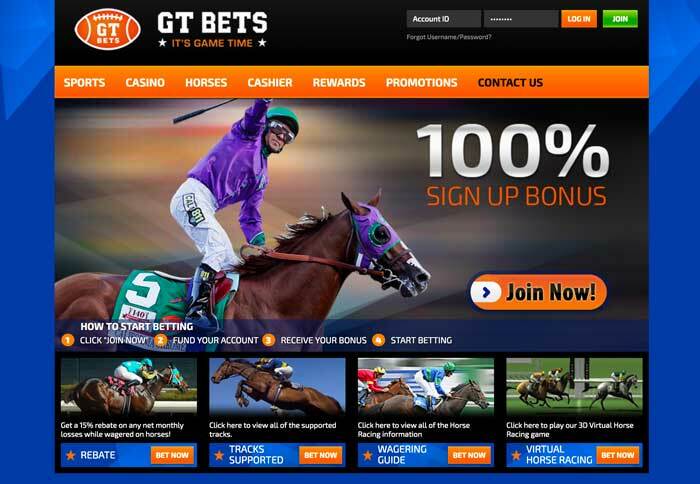 For an online gambling site that brings to the table sports betting, casino, and horse racing options, GTBets could very well be exactly what you’re looking for. It launched back in 2011 and has since that time been able to provide a large range of games and sports betting options. The site has a very standard overall layout, although it uses vibrant blue and orange colors to stand out to the masses. In the casino section, you’ll find games from Betsoft and Arrow’s Edge. 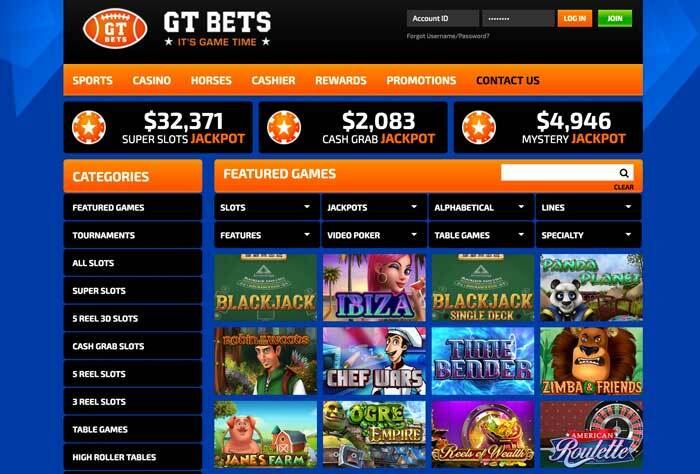 GTBets is one of the few online sites that allows US players to sign up and participate in sports betting and casino games. Even though this is the case, there are certain states that cannot register. These are Missouri, New York, Washington D.C., Kentucky, Maryland, Louisiana, and Washington State. Other than this, there are several countries around the world that cannot become members of the site, including Russia, the United Kingdom, Latvia, Canada, the Netherlands, and Italy. The platform does hold a gambling license, which keeps everything safe and fair for members. This license is on hand from the government of Curaçao. A lot of online gambling sites hold licenses from this jurisdiction, although in relation to the GTBets platform, you won’t find any information about this available to view on the website. But you can rest assured that everything is regulated and secure there. 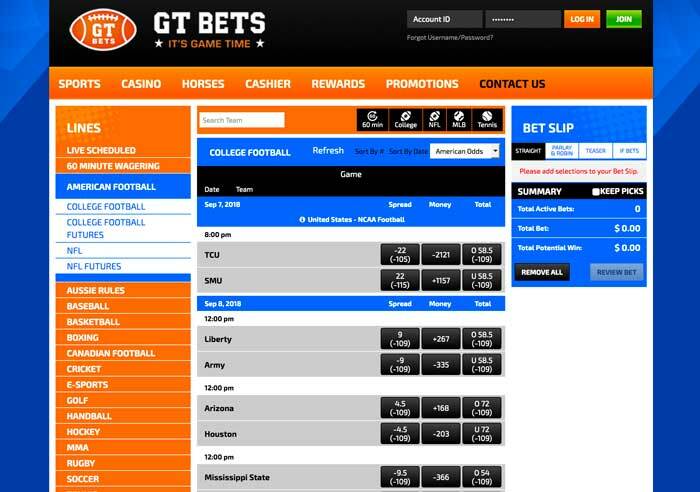 If you’re a fan of playing games using a mobile device, then you can do this with the GTBets platform, too. Both the sportsbook and the casino sections are accessible from a smartphone or tablet. You simply need to enter the website’s address into your device’s browser, and you’ll automatically see the optimized version of the platform. You can also make deposits and withdrawals via your mobile device, meaning that you’ll have a lot at your fingertips with regards to GTBets. 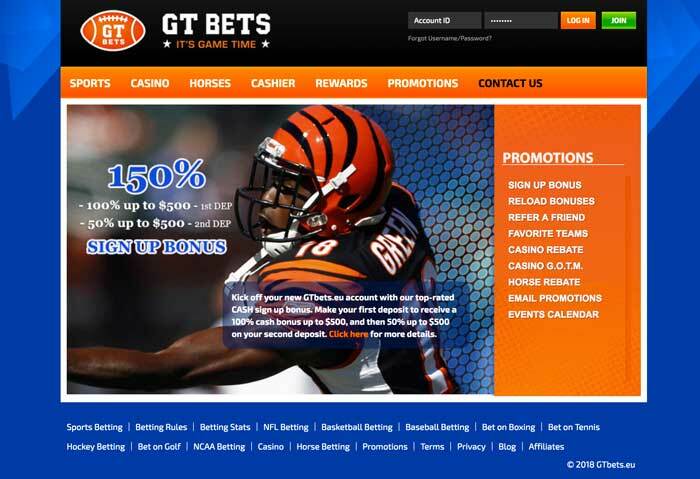 The GTBets platform is also a great location to become a member of if you enjoy receiving promotional offers. You’re able to claim a sign-up bonus when you complete your registration and continue with making your initial deposit. On top of this, you will be given a 100% bonus up to $500. Then, when you make your second deposit, this comes with a percentage of 50% on top up to $500. Therefore, the welcome offer stands to provide you with a maximum of $1,000 altogether. To claim these bonuses, you simply need to complete your registration and then proceed to make qualifying deposits. These qualifying deposits need to be at least $35, and it is tied to a 5 times point rollover as well. Furthermore, sports wagers with odds of -300 or less will not qualify for rollover point earnings relating to this offer. If you make your first deposits via Skrill or Neteller, though, you won’t be able to receive the 100% on top of your initial one. You’ll still receive a 50% bonus up to $500 instead, though, which also has a 5 times point rollover requirement. With regard to this rollover requirement, these points are awarded for every $10 that you wager. Different amounts of points will be given depending on what your wager is placed on. So, for example, you’ll receive five points for every $10 wagered on sports or two points for a bet on the casino games. Once you have completed the rollover point requirements, you’ll be able to make a withdrawal. 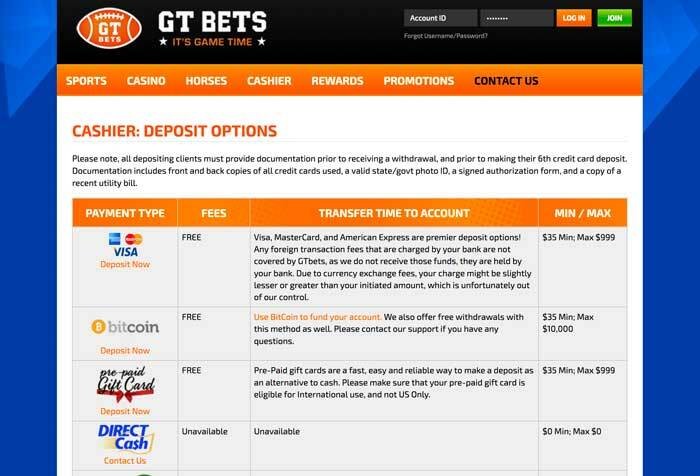 The payment methods that you can make use of at GTBets are several, although this relates solely to the depositing options. If you want to make use of a credit or debit card, the platform accepts transfers from Visa, Mastercard, and American Express. You need to deposit at least $35 with this method, but the maximum depends on your player status. Alternatively, you can make use of a Bitcoin deposit, which enables you to deposit up to $10,000. Prepaid gift cards are also available to use for deposits of up to $1,000. You need to make sure that these are eligible for international use, though, not solely within the US. QuickCash is another option that is open to you, allowing you to transfer up to $690. Finally, Skrill and Neteller e-wallets can be used as well, although for the latter, the minimum deposit stands at $50. All deposit methods are free to use, except for QuickCash. If you opt to use this method, you will only get a free deposit if you’re transferring $200 or more. Anything below this will charge you a fee of $10. When you’re ready to cash out some funds from the site, you can make use of a select few options. The first of these is the bank wire transfer, which comes with a $60 fee. You’re able to withdraw a maximum of $5,000 with this option, and it can take up to 12 business days for the transaction to be complete. If you deposited via Bitcoin, you can also withdraw via this method. This provides a free withdrawal and allows you cash-outs of between $300 and $5,000. The only other possibility is the QuickCash option, which gives you the chance to receive your money within 48 hours. This is available between Monday and Friday, although it has limited availability in general. There’s a minimum fee of $50 to pay or 8% of the amount that you have requested to take out of your account. You need to contact the support team to utilize this method. Should You Play at GTBets? It’s true to say that GTBets does provide an intriguing enough platform to sign up to and enjoy. However, it does have its areas of downfall, too. The biggest one of these is the fact that withdrawals come with such ludicrous fees, unless you decide to utilize the Bitcoin option. But not everybody possesses Bitcoin, so you’ll always end up paying a fee for a withdrawal in this instance. Furthermore, we’re not sure why it doesn’t open its services up to certain US states. Alas, for the negative points that pertain to GTBets, it has plenty of positives, too. For example, you’ll find that the casino has a great choice of games on hand for players to access. Additionally, the sign-up promotion makes for an appealing offer to claim, especially considering it stretches across your first two deposits and can be used in any area of the site. The ability to play on a smartphone or a tablet is also very inviting, meaning that you won’t miss out on your favorite sports bets or even on playing casino games when you want to. Finally, we’re also impressed by the knowledge and friendliness of the customer support team at GTBets. Granted, this isn’t something that is available on a 24/7 basis, but the team will help you out whenever they can.